As part of the upcoming Aqua Metropolis festival in Osaka, engineering firm NTT Facilities has developed a pair of solar-powered, UFO-shaped floating water purifiers that will be deployed in the city's canals and in the moat at Osaka Castle. The disc-shaped machines -- called "Solar UFOs" -- weigh about 3.4 tons each and measure 1.6 meters (5 ft) tall and 5 meters (16 ft) across. During the day, an array of solar panels power the machine's filtration system, which pumps fresh oxygen into the water while removing impurities. At night, a 1.3-kilowatt solar battery provides juice to the LED lamps lining the edges of the floating craft. The machines, which can purify about 9,000 liters (2,400 gallons) of water per day, spray the clean water out through a nozzle on top, like a fountain. In addition to keeping the surface clean of bird droppings and grime, the water spray keeps the solar panels cool, helping to maintain a high output efficiency. The Solar UFOs are built using technology developed by NTT Facilities, a Tokyo-based company (part of the NTT Group) whose business includes architecture, construction planning, power supply system design, and the management of large-scale solar power plants. The water cleaners are currently not for sale. 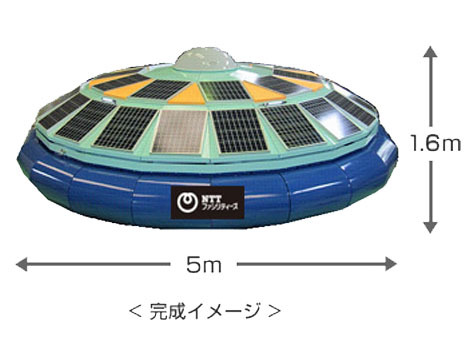 Plans are to keep one Solar UFO operating in the Dotonbori canal (in central Osaka) until mid-October. The one in Osaka Castle moat is scheduled to remain in operation until the end of March 2010. 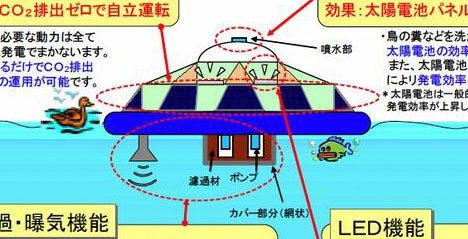 NTT Facilities also announced plans to deploy Solar UFOs in Tokyo-area waters in the near future. The idea is sure nice, but this design looks horrible. I can only hope it is preliminary. The design is easy to paint down and someday out. But the work this does is outrageous and could restore beauty all over the world. Best idea of at least the month and maybe the year. The Japanese "get it". The next industry is environmental management but the Americans are still obsessed with churning out smart bombs. We need some of these in our local delta - we have the longest in-land deep water port or some such like that, and as such, ships from all over the world come here and dump their bilge water and what-not. It's dirty and smells bad. However, even if they were for sale, it's the last thing a town like mine would buy. This like a UFO which is made for any shooting of any hollywood film. This is wonderful in point of view to clean water and also in this mechanism solar power utilities.that means it also helps to conserve another energy resources. Simple and fantastic idea! Can't wait to see these operating globally! We need more inventions like this. Absolutely ridiculous. 9 m3 per day is useless, and , how do they plan extract the rubbish of the filters? It is a joke. I also wonder... how much waste it costs to create an ufo. Ditto kurisu--why aren't these being used by BP?? What about something like this out in that Texas sized plastic dead zone in the ocean? How it would process the plastic would be the trick though. PLEASE LET ME KNOW THE PRICE AND SEND ME THE EQUIPMENTS DETAILS WITH QUATATION BECAUSE HERE IN KUWAIT AND ALSO IN MIDDLE THERE IS LARGE REQUIREMENT OF THIS EQUIPMENT. UFO shaped, solar powered water purifiers in Japan | Mutate! ???? » Blog Archive » UFO????? ?